Crunchy Fried Shrimp recipe by SumeraNawed at DesiRecipes.com. In a medium bowl, stir flour, cornstarch, salt , baking powder, egg whites, water and oil together with a whisk. Pour out a liberal amount of corn flake crumbs on a dinner plate. 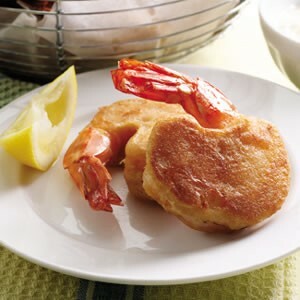 Roll each shrimp into a batter mixture and quickly roll in cornflake crumbs. Deep fry shrimp until golden brown. Best with our pineapple chilli dipping sauce.